Chevron that received the right to conclude the production sharing agreement for the projects on hydrocarbons extraction at the Oleska area continues negotiations on the text of the agreement with Ukrainian partners. On 12th of June, 2013, the Cabinet of Ministers of Ukraine has extended the term for negotiating on the agreement conclusion for 180 days more. The web-site “Ekonomichna Pravda” has made public the text of the draft agreement together with the comments of the Ministry of the Economic Development and Commerce of Ukraine. The comments include not only technical remarks, but also proposals regarding fundamental issues, in particular, the mechanism of the extracted products distribution on the different stages of the project realization. On June, 17 Ivano-Frankivsk regional council has publicly informed about receiving for commenting and approval the draft text of production sharing agreement between the state of Ukraine, Shevron Ukraine B.V. and LLC “Nadra Oleska”. And o June, 18 the regional council hosted public discussions about the shale gas extraction projects at the territory of Ivano-Frankivsk region with the participation of technical director of Chevron in Ukraine, Mr. Gabriel Grimaldi, and environmental specialist of Chevron, Ms. Marie Julien. The experts of Ivano-Frankivsk national technical university of oil and gas (IFNTUOG) have also joined the discussions and admitted that they have sufficient expertise and technological developments for controlling the shale gas extraction process in Ukraine. The Head of regional council, Mr. Vasyl Skrypnychuk, declared that the draft agreement will be discussed at the meeting of regional council, but according to Ukrainian legislation any document, which is to be discussed at the meeting of the council, should be submitted 20 days before the meeting. 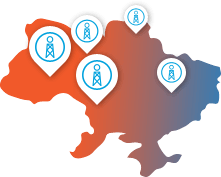 Mr. Skrypnychuk invited civil organizations to hold broad public discussion on shale gas extraction in general and product sharing agreement in particular. He also presented several comments on the text of the PSA, particularly, on the inclusion of Ivano-Frankivsk regional council as a equal partner, involvement of the IFNTUOG experts and economic support of communities in the region. Mr. Skrypnychuk also noted that Ivano-Frankivsk regional council is interested not only in the social-economic issues of the agreement but also in financing of alternative energy projects for strengthening energy independence of Ukraine. Lviv regional council also confirmed the receipt of the draft production sharing agreement for approval. The Head of Lviv regional council, Mr. Petro Kolodiy, noted that deputies should carefully study the document and receive answers for many questions before any desicion to be made. To start with these are questions on environmental risks of shale gas extraction, mechanisms and methods for their avoidance and compensation. According to the draft agreement, Chevron will pay only the income tax, VAT, the fee on the subsoil use and the tax on incomes of the individuals. During the validity of the agreement only those legislative provisions that were effective at the date of the agreement conclusion will be applicable, except the cases when changes in law will be beneficial for the company, for example, those that foresee reduction of tax payments. It is foreseen to drill 8 vertical and 5 horizontal wells on the stage of the geological investigation of the site that will continue for 5 years. The investments during this stage will constitute USD 350 million. An environmental impact assessment is expected to be executed by the project operator before the geological investigation on the site.